I was looking for a great Thanksgiving side dish recipe for quite some time, and this ended up being the chosen one! Orange and carrots sounded like a winning combination and the addition of the parsnips mixed things up a bit. I think this is pretty much a foolproof recipe as long as you make sure to check the dish about an hour after being in the oven. The first time I made this I thought the parsnips and carrots were a little soft (but still delicious), so when I actually made it on Thanksgiving I made sure to keep an eye on it and cook a little less longer, checking for firmness of the veggies. I also had never cooked with parsnips before and enjoyed them – they almost reminded me of a potato instead of a carrot-like vegetable! The best part about this dish is that it can be served hot, warm, or at room temperature. It takes awhile to cook, but the pressure is totally off when you know you can make it early in the day and it still will taste good at room temperature! Place a rack in the upper level of the oven and preheat to 450F. 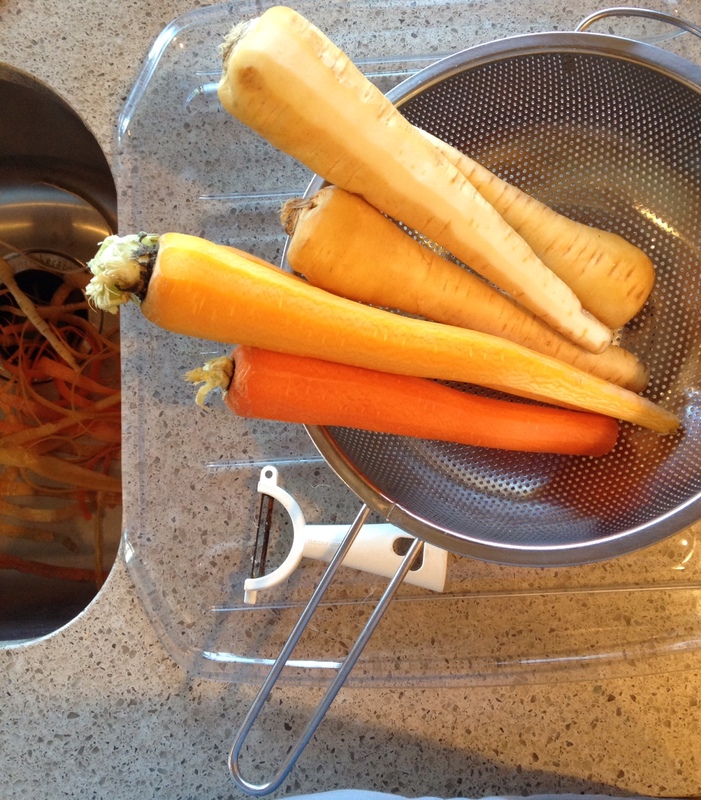 Trim and scrub or peel the carrots and parsnips. 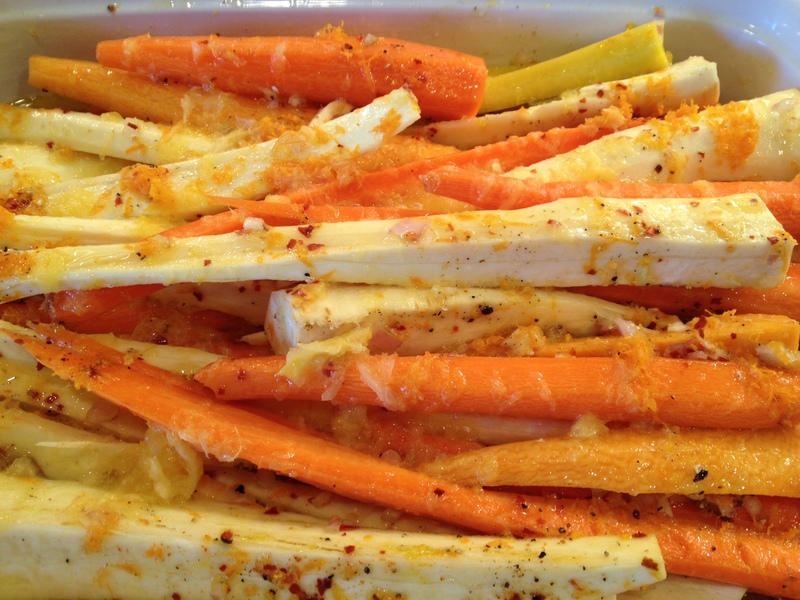 If the parsnips are thick, slice them in half or quarters lengthwise so they are about the same width as the carrots. 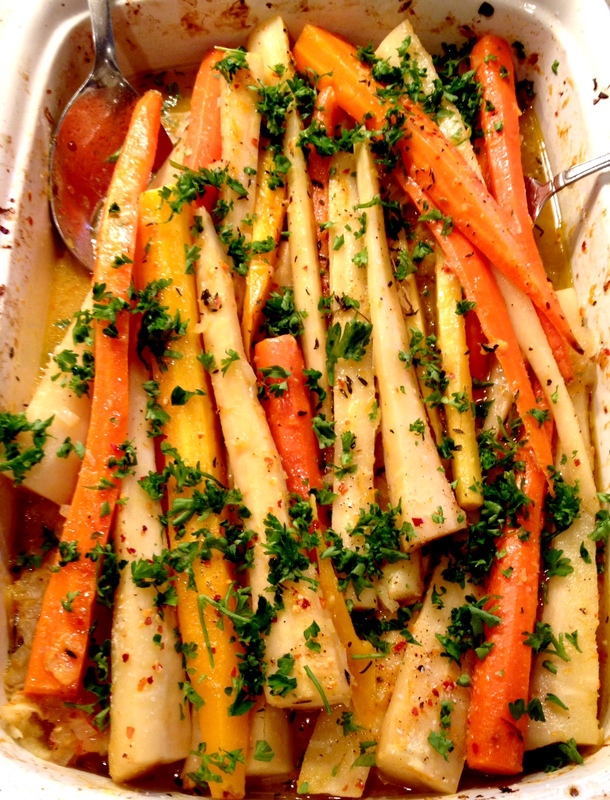 Place the carrots and parsnips in a baking dish that is large enough for them to lie flat. Add the shallots, orange zest, orange juice, olive oil, thyme, red pepper flakes, about a tsp of salt and pepper and toss to combine. Place the baking dish on a rack in the upper level of the oven and heat until the liquid becomes hot and slightly bubbly, about 15-20 minutes. Remove the baking dish from the oven and set the temperature to 275F. Move the rack to the center of the oven. 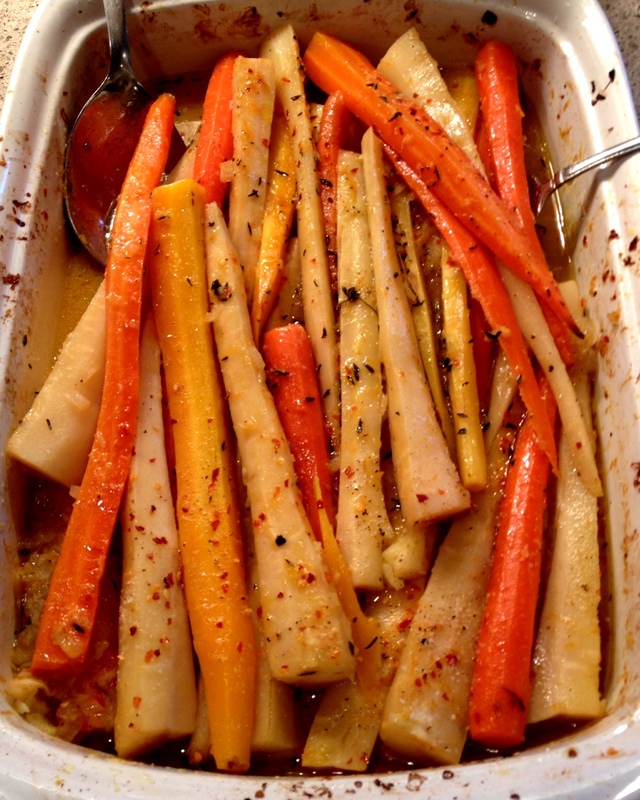 Cover the baking dish with foil and cook for another 60 – 90 minutes, or until the carrots and parsnips are tender. Discard the thyme bundle. Sprinkle with the remaining 1/2 cup of orange juice and the parsley and season to taste. Serve hot, warm, or at room temperature. NOTE: I didn’t have a dutch oven large enough to lie the vegetables flat, so I went the route of doing everything in the oven. Ina first cooks the vegetable and orange mixture on the stove and brings to a boil over medium-high heat, then transfers them to the 275F oven. She also adds 1/2 cup of orange juice at the end, where I just added it all to the mixture before cooking. I think this is a “foolproof” dish either way!